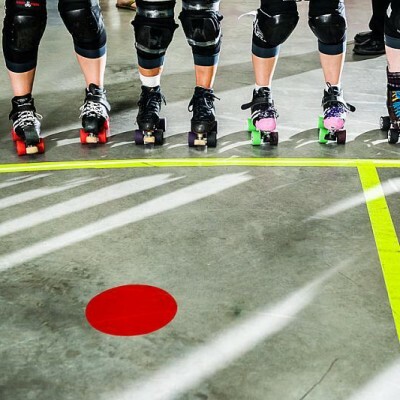 Got a chance to go someplace cool for roller derby? Want to avoid paying nasty checked bag fees for your trip? 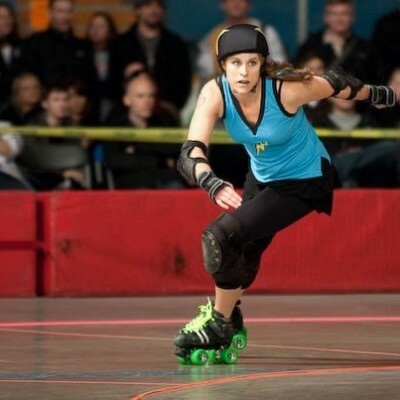 Then you’ll want to check out my tried and true method to pack for roller derby travel. These tips mainly apply to air travel (using maximum carry-on sizes), but they can definitely help out if you’re trying to stuff four teammates into a Honda to drive to an away bout too! Among other trips, I’ve used this packing method to coach and sightsee in Europe for 10 days in winter, as well as my current 26-day journey consisting of camping at a music festival in the rain, hitting up Men’s Roller Derby World Cup in Calgary, and finishing at Rollercon in the 110 degree Las Vegas heat. The basic premise of my packing method is this: derby gear and street clothes in a regulation-sized roll-aboard suitcase; shoes, toiletries, and laptop in a backpack. The suitcase goes in the overhead storage compartment on the plane (or fits neatly in the trunk of your car) and the backpack goes at your feet with all the stuff you’ll want handy for the plane trip itself. Wheels come off my skates. This lets them nest together and saves a ton of space. Helmet clips on the outside of my suitcase and tucks into the overhead bin on the plane. I work hard to pack only what I’ll need, and assume I’ll re-wear and/or wash my street clothes on a longer trip. Reducing the amount of stuff I bring along is actually less stressful than having everything with me, and struggling to make it all fit. I use ziploc bags and press the air out of them to organize and reduce the volume of clothes (and keep my wrist guards from stinking everything else up). I roll all my clothes to save space and reduce wrinkles. I wear my bulkiest shoes and clothes on the airplane to save luggage space. It’s usually ice-cold on the plane anyway! I keep small derby necessities (mouthguard, whistle, other bits) and my skate tool in an easy-to-reach outside pocket. This helps keep them all together and will prevent a full un-packing show if the security screener wants to take a look at my skate tool. Learned from experience on that one! Liquids and gels go in a ziploc at the top of my backpack for easy access at the security screening line. Most major airlines allow a piece of luggage at about 15.5” x 21.5” x 9,” plus a ‘personal item’ like backpack, laptop bag, or purse. My backpack is technically larger than the ‘personal item’ size and definitely heavier, but I’ve never ever been hassled. American Airlines in particular is super strict on the luggage size, so be sure to measure your larger piece of luggage to avoid a nasty, expensive surprise at the airport. 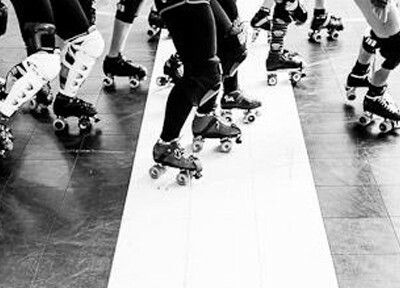 You may be saying, “sure, but I wear size 13 skates, or XL knee pads, (or whatever!) and this won’t work for me!” You’ll see in the video that I still make this work even with a super-annoying, space-eating, rigid knee brace. I’m pretty sure almost everyone can make this work! Normal skate tools (the tri-tip shaped kind, or other small wrenches) are permissible under North American carry-on restrictions. I’ve had mine inspected before and it always passes. The official restriction is on “any tool with a head and shaft measuring more than 6cm / 2.4 inches” so don’t bring a full-sized socket wrench for your wheel nuts! All liquids and gels must be in containers 100mL / 3.4 oz. or less and packaged separately in a clear plastic bag for inspection at the security screening belt. Unfortunately hummus and peanut butter are both classified as a liquid somehow, and I’ve had them both confiscated. Sad trombone. Check your airline’s carry-on baggage guidelines before you pack to make sure you’re on side! I have only been shut down once in about twenty flights with my skates in carry-on (thanks, Adelaide, Australia security lady. You’re doing your job SO HARD!). There’s no reason they should be an issue. I love comments. Comments are the best (after pre-hab, that is. Pre-hab is the actual best). 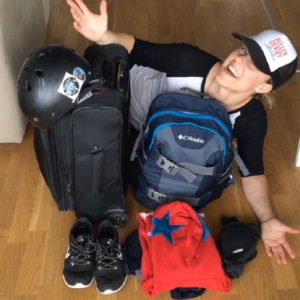 So tell me how you pack for roller derby travel! I want to share your secrets! I’ve made it through security with peanut butter, hummus, and yogurt by freezing them. If you want them for travel snacks, pack in small individual containers (I use jello shot cups) that you can defrost in your hands. Scorey, that is truly GENIUS. Thank you for this excellent travel hack!! Thank YOU for the packing tips. I never thought to remove my wheels to save space and I always forget to leave my liquids on top.